A very Happy New Year to everyone at the Nut Press from me! My name’s Jane Lovering (yes, honestly, that’s my real name, so I couldn’t write any thing but romantic comedy, could I?) and the resident squirrels have very kindly agreed to host me here today so that I can tell you all about my new book Please Don’t Stop the Music. Jemima Hutton is determined to build a successful new life and keep her past a dark secret. Trouble is, her jewellery business looks set to fail – until enigmatic Ben Davies offers to stock her handmade belt buckles in his guitar shop and things start looking up, on all fronts. Oooh, I hear you cry, for my hearing is excellent even if my sanity is questionable, a book about Dark Secrets, that’s just my cup of tea! Then draw closer, grab yourself a cup-cake, it’s all right I brought enough for everyone, and I shall impart some of the Dark Secrets involved in the writing of Please Don’t Stop the Music… Actually, don’t draw close, you might get crumbs on my shirt. Now, where was I? Ah yes, Dark Secrets. Well, my first writing secret is this… I actually wrote the book with my laptop balanced on my knees whilst sitting on my bed. Yes, not for me the desk and chair arrangement! No! I eschew comfort and convenience in favour of sore knees. See how I suffer for my art! What, you want another Dark Secret? All right, try this. The book was almost entirely fuelled by Spearmint Chewing Gum and Diet Coke. For some reason, whilst I am writing my mouth wants to eat things, and chewing gum and diet coke are the only ways for me to avoid having a bottom the size of the Isle of Wight. It also means I get plenty of healthy exercise plodding along the landing to the loo every five minutes. Right, off to make some New Year’s Resolutions…mmm…how to improve on perfection…? Yes, tricky. I’ll leave you to ponder how you could possibly do that, Jane… Thanks for getting 2011 off to such a great start here at The Nut Press. The squirrels said the cupcakes were yummy and wondered if there were any more. They do also wish you every success with Please Don’t Stop the Music. or The Book Depository. Jane can be contacted at www.janelovering.co.uk or on Twitter @janelovering. COMPETITION: Want to be in with the chance of winning a copy of Please Don’t Stop the Music? Leave a comment below telling us one of your Dark Secrets by midnight (GMT) on Thursday, 6th January 2011. I pay a man in a van to clean my wheelie bin every fortnight. It ‘s left with a different perfum each time he does it, lavender, rosemary, citrus … does that count as a dark secret? Or just a dirty one? Please Don’t Stop the Music sounds wonderful – hope I win! My dark secret is that my writing is almost entirely fuelled by cups of tea rather than the champagne and chocolates that I would prefer you to believe…. I would very much like to win a copy of Please Don’t Stop The Music so I have something to do besides writing when the caffeine jitters kick in. ‘Please Don’t Stop The Music’ sounds fab …. I’d love to read it. My dark secret is that I have just inadvertently thrown away a Sylvanian family baby meerkat that belongs to my 6 year old and as retrieving it would involve rummaging through ‘the Bin Of Doom’ I’m hoping the aforementioned 6 year old wont notice. Sadly Rachel we don’t all have access to a man in a van who ‘cleans our wheelie bins’ (not entirely sure that’s not a euphemism by the way). And I would like to win a copy of Please Don’t Stop The Music because I heard Jane read the first chapter at a reading and I need to know what happens next! I’ve been racking my brain to think of a dark secret that I’m harbouring, but I can’t think of any. How boring I am! However, I saw you tweeting on twitter and came on here and read about your book and would love to read it. Perhaps that is my dark secret – I’m a secret stalker on twitter! Shhh. Can you keep a secret? Don’t tell anyone but dark secret is I’m in love with a man other than my husband and have been since I first saw him and heard his voice many years ago. An unrequited love that will never develop into anything more than a longing and wishing and once upon a time, a hoping. He kissed me once, on the cheek, even knew my name, even dedicated one of his songs to me. I will love him till I die. PS. My husband already knows this secret so blackmailers need not apply. Wishing you well with the book! Oooh, you naughty lot! Lost meercats, secret stalking and An Other Man… Carola, I share your hatred of the white stuff, but it’s not a secret, I tell EVERYBODY every time it snows! When i was at school a long time ago, my parents trusted me with the front door key, on arriving home i went to my purse to find the key missing, i was scared as my parents would be angry. With the help of my next door neighbour, we got my dad’s ladders out and climbed in through my bedroom window, after going down stairs and helping my neighbour to put the ladders away i changed my clothes, to find the key hanging around my neck on a chain, oh did i feel stupid, i confessed to my dad who saw the funny side but never told the neighbour. This probably doesn’t count as a dark secret, but i am Jane’s biggest honestly i am i start my diet tomorrow, win or lose i can’t wait to read this latest book i enjoyed the others so much. My dark secret… I must have one *thinks*, um… Maybe I need another cup of tea, I can’t be that boring, can I? (Don’t include me in the comp as I already have a copy on its way to me). Can’t wait to read it. I came over here this morning from Karen Gowen’s Coming Down the Mountain. She has the MOST wonderful followers!! This is certainly intriguing–the book as well as sharing some dark secret. I can’t think of very many real secrets. But there was an incident when I was ten and I talked two neighbor boys my age to go with me to the vacant lot and then I told them to sit on pile of rubble and then I talked them into letting me kiss them. I made them promise never to tell anyone. I don’t think they ever did. They probably decided it was too silly to tell. LOL Oh, the silly things we did when we were young!! Anyhoo, I guess I should add my own dark secret to the mix… it’s those pesky squirrels who actually do all the writing. I am merely chief purveyor of nuts and liquid refreshment, such as the evening glass of amaretto… What do you mean you knew that all along?! Hurumph. Fennie, funny you should mention it, but there is an Adventures of Squizzey in the works. He is the original squirrel and he insisted that it mostly be about him, although the rest of his crew do feature in supporting roles… He’s dictating it, kind of like the Barbara Cartland of squirrels but grey, not pink! So rather than share one of mine I will share one of my house’s. When redecorating the bedroom and lifting the carpet I found a rather interesting envelope. Thinking it may contain money I investigated to find some rather saucy B&W photos of the previous residents! They had obviously been stored there for some considerable years and forgotten about. I didn’t feel it was appropriate to forward them on to the family (as the owners had passed away) so the pictures of their youth have remained a secret for the house and me. Oh, and the wheelie bin…..I wasn’t going to keep them! Fingers crossed for Please Don’t Stop the Music. Ann – I wonder if those boys ever look back on that day and wonder how they managed to get so lucky? And Catherine – I wonder if the ex-occupants of your house ever woke up in the middle of the night in sweats of terror in case you discovered their secret? I’ve got a very dark secret. It is so dark you will never see the light. And no, I’m not a man. But I still want a copy, please, please, please, please. I’m not very good at calculating distances -see scratched car bumper for reference- so when I was very new to the baby in arms feeling, I had difficulty in understanding that I had a broader width and I bumped my month-old-baby’s head against the door frame. I still feel bad about it, but I’m lucky she doesn’t remember after 7 years. She probably does wonder why she’s got a dent in her head though. Ooh, I have a dark secret – when I was eleven I discovered a bottle of Baileys in the cupboard. I couldn’t resist a sip – or two – or three. Or four. My mother thought I was ill but I was actually slightly plastered. We start young in Scotland. Hic. If I ever had desirous needs for a packet of Spangles, some Fruit Salad chews or a Curly Wurly, my best friend and I would promise two boys in our class that we’d show them our knickers at the back of the mobile classroom at breaktime. I always had loads of fillings and still slept with a clear conscience even though they never caught a glimpse of my undies. Sarah – it’s okay, I understand. I used to do that a lot, especially when my first was in the babysling – stand up too quickly and brain the poor devil on things. It’s okay though, he’s a guitarist, so any damage isn’t noticeable. And Debs – yes. Sadly, yes it does. Well, I have many, many dark secrets, but of those that are fit for human consumption perhaps the funniest was when I was 15 and had been forbidden by my mother to see a certain boy, who was several years older than me. In a vain attempt to fool my mother that I had been swimming when in fact I had been to see him, I ran my swimming costume under the tap and wrapped it messily in the towel. Upon my return home my mother instantly looked me up and down suspiciously, felt my hair and smelled my towel – “no chlorine and dry hair” she said, “you have been to see Mark!!”. So my dark secret is I am the worst liar…..ever!!! Hope it’s me who wins the book as it sounds ace! The squirrels put all your names into a random draw and picked the winner of a copy of Jane’s book and it is… *stamping of squirrel paws* …Sylvie!! Congratulations! Thanks to everyone for dropping by and taking part and I hope you all get yourself a copy of Jane’s book. It’s sure to be a great read and it might also help make you feel better about your own Dark Secret, when you read those in the book! 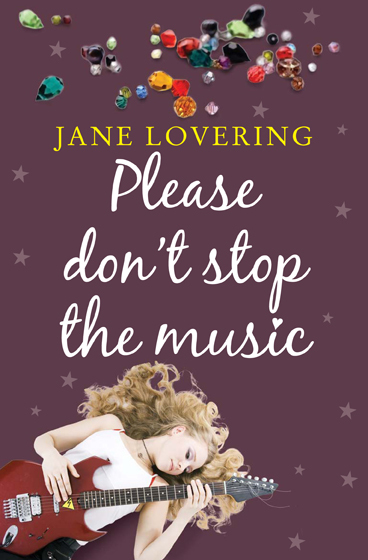 The next stop on Jane’s Please Don’t Stop the Music blog tour is tomorrow (Saturday, 8th January 2011) at http://strictlywriting.blogspot.com/ Pop on over and say Hi! Thank you so much, Kath. Am looking forward to reading. And thanks also to everyone else who entered. Thoughly enjoyed reading them all. Many congratulations to Sylvie – I really hope you enjoy the book. And thank you to the squirrels for hosting me here at their lovely blog! It’s really very nice here, if you ignore the shells everywhere – I did wonder what to do about the hazelnut I sat on, but I worked it out in the end…. Thank you to all of you who commented and made me feel so welcome, and to the wonderful Squirrel-Sponsored Kath Eastman. I go now to leave my slippers under another sofa, but shall be visiting often. Thanks again.